Here at William’s, we have developed our William’s California Wine Kits with this philosophy in mind. Our Kits include 192 ounces of pure California varietal grape concentrate, condensed at temperatures that never exceed 180 degrees F. from Central Valley wine grapes picked at their ripe peak in the late Summer and early Fall. To complement the varietal juice, specially selected dry wine yeast, oak chips, and nutrient are also included as needed. Unlike many wine kits featuring added sugar, this 192 ounces of pure concentrate is all that is needed (except for the yeast and addtives) to produce 5 gallons (24 bottles) of varietal wine. This Chardonnay Kit features grapes grown in Woodbridge, California. Chardonnay, a grape that produces a full-bodied white wine with a hint of buttery softness and full fruit character. This one can taste fully mature at 1 year after bottling, and be very drinkable after 6 months. I've made this wine twice. The first batch I poured down the drain. The second is headed the same direction. 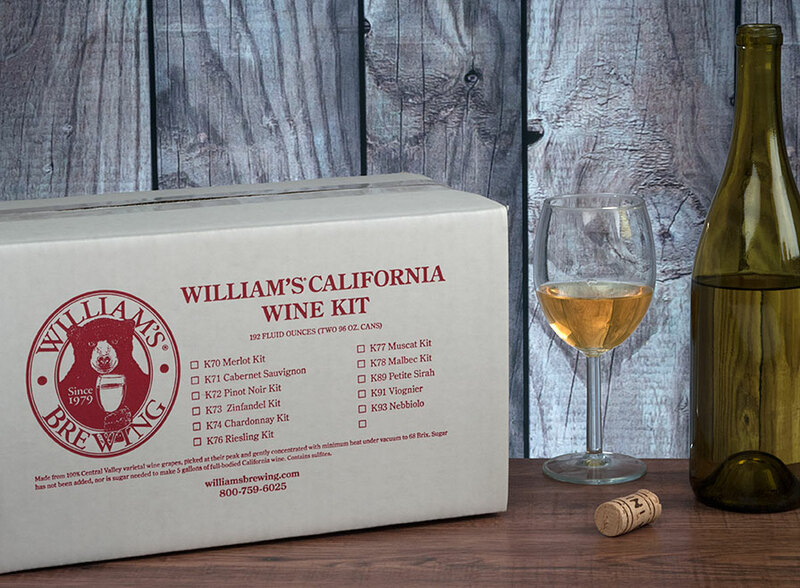 I've been a very successful home brewer for nearly 20 years but have had almost no luck with the wine kits from Williams. I've tried 6 or 7. I wanted to enhance the oak in the first 3 kits and that did not end well, so that's my fault. The next 3 or 4 however, did not even come close to 2 buck Chuck in drinkability. I like Williams and buy nearly all my brewing supplies from them, but their wine kits don't work for me. I'm sure Williams means well by offering a low priced kit, but if you know anything about winemaking you need to know what you're starting out with. With these kits you're totally clueless, and that won't produce good wine. We served this to our parish priest who is French, and he really liked it. He took a few bottles home and spread to word to other wine-loving members of our congregation, who also got some bottles. The only downside to gaining fans is that I'm losing wine! This wine is best if you can keep yourself from drinking it all right away. A year on, it has really matured well. My beautiful girlfriend turned me onto Chardonnays. She has a palate for 'oaky' Chards and typically spends $20+ a bottle for quality Chardonnays. We decided to try Williams Chardonnay this past winter, and it was in the bottle late April. I did add french oak to the secondary(not included in kit), as I mentioned, she likes an 'oaky' Chard. This wine fermented out great and was VERY tasty sneaking samples as it worked in the fermenter. We regularly opened bottles as it aged and each just kept getting better and better! Very buttery, strong hints of apple, and of course oaky. I just built our second batch today and as fantastic as this Chardonnay is at a young age, we will be buying many more in order to hopefully build a stockpile in hopes of some making it past 1 year. Quality Chardonnay...you can't go wrong with this one! from bakersville What is this stuff? Was my first reaction to the crystallized sugar in the cans. Not knowing about the canning process, I would have to say - old. But I just moved it from the fermenter to a carboy. Seems ok (will let you know). Just started another, this one just juice (not kit) and it's fine-no crystals. Never had problem with fermentation or taste. When I want it oakier, I add my own, but the buttery, full taste is delicious without. I've been buying the chardonnay for years, always good. Am still curious about the sugar lumps at the bottom, however? ?